Velvet nails have been on the rise! Ciaté has come out with velvet manicure set that retails for $19 to $25 but you can get this look much cheaper at home! Nail polish in a similar color to your powder. You can pick up flocking powder from your local craft store in the glitter area or by the scrap booking supplies. They are usually around $2-$5 for a large container of powder. 1. Paint your nails your base color and let dry. This will help the flocking powder appear fuller in case there are any bald spots after it's been applied. Coat one nail with a second coat of polish. 2. While still wet sprinkle flocking powder over the nail. 3. Gently press down on the powder until it is level and smoothed down into the wet polish. 4. 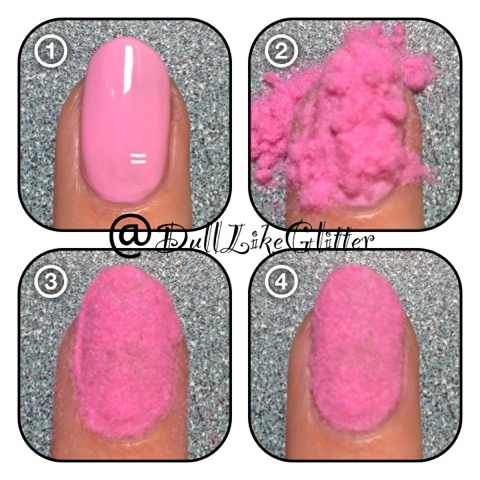 To clean up gently push the flocking powder away from the nail bed and skin and onto the nail. For powder that is on the skin you can brush it away with a small makeup brush or blow it off. Continue onto the next finger and complete each one at a time. When finished let the mani dry and you're done! Do NOT top with any sort of top coat. This will cause the texture and look of the velvet to be ruined. No worried if this manicure gets wet! It may be a little damp but will dry after being submerged in water. This look will last you quite a few days! It is not as temperamental as a caviar manicure look. Here is the velvet manicure technique I did on the accent finger. I used China Glaze Liquid Leather for the black base, Essie A Cut Above for the pink glitter and Butter London Matte top coat on top. For the accent finger I used Ruby Wing Pink Rose and pink flocking powder from Michaels craft store.